As creatives go, it’s always nice to meet other people who are on your wavelength. That’s one of the great things about doing interviews is that it gives you a reason to meet people. Whether that’s in audio or video form, doing interviews not only gives you this opportunity, but it allows you to have a platform that you define while at the same time sharing it with someone else. Through his efforts, Engel Jones, has become a master of making connections and sharing his platform. Through over 2000 conversations in the last couple of years, he’s connected with amazing people at all levels. On top of this, last year he and his wife went on a tour of the United States to talk to many of these people (again) and have an in person conversation with them. 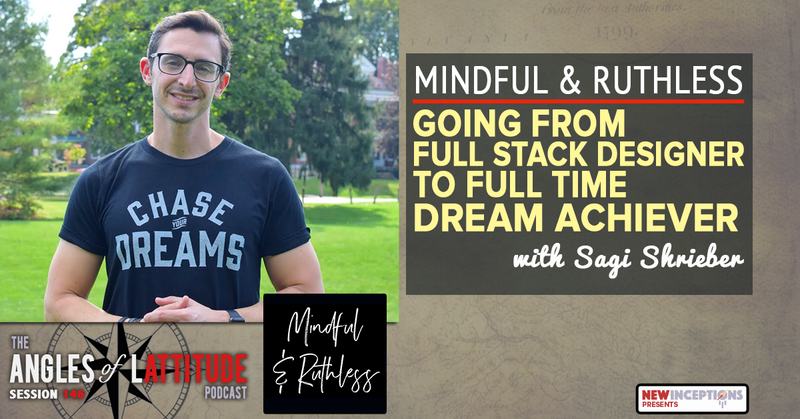 In this conversation, find out in his own words why he started his podcast and what he’s learned along the way. It’s a result of a lot of strategic reorganizing I’ve been doing recently. This week, I’ll be pushing out session 134 with Antonio Smith, and as I said in the last session with Dom Brightmon, it just feels with all that’s going on with New Inceptions and Amplify Indy – I feel like it’s time to actually get over the hurdle of going from strictly FREE to PAID content. Personally, I feel that $3 is a good number for a monthly patron fee. It surely isn’t going to break the bank, and frankly, one typically can spend more on drive thru food. Since what the show has to offer is comparably more beneficial, I think it’s a fair starting price. That said, you might be wondering what has taken me so long to pull the trigger on this decision. Well, I’ve been struggling with what’s called the FREE to PAID hurdle. How do you make something that starts off free into something you pay for? Will the audience still be there once it goes behind a paywall? What’s the right price point? In this post, I’ll give you a few of my thoughts after hearing a podcast over Fizzle awhile back. When it comes to what we think of the “traditional” offline world of business, NOTHING is free. However, since the mid to late 2000’s, the internet has revolutionized how marketing is done. No longer do we first hear something on a show or commercial on a major network or channel, then determine if we want to buy from there. Instead, when we hear a name, product, or service we go look to see what’s on the web about said item or person. We look for reviews in Angie’s List. We look to see if they have any other content. Or we go to Amazon to see what others have thought about the item in question. Usually, the more content this person has out there or the more good reviews they or the product have, the more we pay attention to it. Eventually, there’s a good change we will buy whatever is being sold. Podcasts in the past have been a part of this marketing. Inherently we think that most shows are free. But are they? No content or work is free. It takes resources to produce a good or service. Shows that are on TV are powered by the sponsors of the network through commercials. Big podcasts are typically sponsored by ads as well. Heck, even when you look at big channels on YouTube, they’re doing some sort of monetization – even if you can’t tell up front how they’re making an income doing what they do. When I thought about how I was going to monetize Angles of Lattitude, I originally thought that affiliate marketing was going to be the best way to do it. But as online streaming of podcasts has become more common, we’ve all grown accustomed to skipping past parts of interviews we don’t want to hear – including the pitch at the beginning and end. (For example, I know Lewis Howes and Tim Ferriss usually take 5 minutes to get into their conversations!). Because I’m not a fan of midrolls, I’ve opted not to use them in the show. Yes, I know they’re the only marketing that people don’t always tune out during podcasts – I just personally don’t care for that jump in the conversation. So trying to think of an alternative to doing midrolls, I thought about how people on Twitch make their income. many individuals supporting the show through donations. Many times those donations are through a Patreon or a similar service. After checking with a sample of listeners, it sounded like that last one was something you guys would prefer. A show for the listener powered by the listeners. So there’s my reasoning for getting my account started on Patreon. Again, when you go on there you’ll see that there’s actually 2 categories of support. The first one is for supporters of the show and the the second is more for partners. Remember, that I’ll be implementing this change before 2019 rolls around. So make sure you binge on shows older than a year before Christmas. I’ll let everyone know through the show when the official landing page is up. Also, be sure to check out the post from Fizzle called The Hurdle Between Free and Paid if you’re thinking about making something you now offer for free into something you collect money for. https://i2.wp.com/newinceptions.com/wp-content/uploads/2018/10/NI-Social-Patrons-Only-Making-Past-Seasons-of-the-AoL-Podcast-22Pay-to-Listen22.png?fit=1200%2C628&ssl=1 628 1200 JC https://newinceptions.com/wp-content/uploads/2016/07/NI-Web-Logo8.20165.png JC2018-10-23 13:23:462018-12-27 17:20:39Patrons Only! - Making Past Seasons of the AoL Podcast "Pay to Listen"
If you’re a well known thought leader, getting out a new product, book, service, or course isn’t that difficult to promote. As you’ve climbed to the top of your mountain, there’s a good chance you’ve met plenty of other folks who would love to share time with you about your new product. Unfortunately, not all of us have gotten to the point where we can just reach out to 50 some podcasts and YouTube channels and have tons of interviews about our new warez. However, there are folks out there that have a comparable network to those well known thought leaders. Many times they’re publicists, but in this session’s case, we’re talking specifically about being booked as a guest for podcasts! Jessica Rhodes is the founder of Interview Connections and has been building her business by being the matchmaker for podcasters and expert guests. In today’s conversation, we talk to Jessica about how this business of hers got off the ground and how she and her team can do the footwork for you in getting your message out. Jumping through Hoops, or Working Together? A lot of creatives want to have a podcast. In the past, it took a lot of work to get one off the ground – especially when you’re talking about post production. However, we’re in 2018 and a lot has changed since the mid 2000’s. Including the introduction and evolution of handheld digital devices – particularly phones and tablets. In today’s chat with Spreaker’s Rob Greenlee, we reflect on what he had to do early in his career as a podcaster and how that has changed to today. This is a conversation you don’t want to miss if you are on the fence about starting your own podcast or already have one and want to know where the industry is going. In an Age of On Demand – Is Live Worth It? What did you do over the Labor Day weekend? The “last” weekend of summer? Did you manage to get out with friends or family for dinner? Maybe even enjoy a barbeque? How about your business? Did you do any work on it? Just because it’s a holiday weekend doesn’t mean you can’t work on it! In fact, if you do, you’re just that much more committed to what you’re doing than those who took time off! Personally, I worked a bit on Saturday and Sunday. As I mentioned in the podcast from last week, Maria and I took pictures at the AMS MuncieMan Tri on Saturday. Always fun to get those posted and see all the reactions and comments come in afterwards. Personally I like this particular triathlon because it’s the MECTC championship race and has been for several years now. Always cool to see the different college uniforms of the athletes who showed up. Well, good question. I mean, I did have the same one on iTunes for over 100 episodes. Why change it? Well, a couple of reasons. One, after 100 episodes, I have a much more focused picture on what the show is about. When I first started, I can’t say that was the case. At the beginning, the idea was to have a few co-hosts on regularly to talk about being successful in life in general. What I realized, though, was that we were starting out WAY to broad. Soon after, however, I started using the format that we know today. Secondly, I noticed that when viewed in iTunes, it didn’t necessarily jump out. So, sticking with the nautical theme, I opted to add a bit more liberty into it by giving it a bit more noticeable red, white, and blue. I mean, Angles of Lattitude does translate directly to Perspectives of Freedom after all! There are some things you’ll want to consider before starting on your design. Once you have the following ready to go, then you’re ready to start. That said, if you don’t want to do the work yourself, you might want to check out Fiverr, UpWork, or 99Designs. Personally, I use Photoshop for most of my work. (Currently running on CS5.) But there’s also free alternatives out there such as GIMP and Canva. If you don’t consider yourself artistic, Canva is a great option as it comes with layouts mostly designed for you. However, if you’re going for a certain theme, like I was, then you’ll probably want to use GIMP. When designing your podcast’s cover art, you’ll want to think about where you’re going to place it. For me, I currently have one image for the generic cover art, and then I have another format that I use for each individual episode. Last, but just as important, is a “social media” image that I make that has the same content as each individual, but laid out a little differently so that it fits within the post space in Facebook and Twitter a little easier. Cover art: 1400×1400 to 3000×3000 pixels – Personally I use 1400×1400. Even with 4k becoming the standard more and more, I simply don’t see a need to make it much larger. Also, make sure it looks good at a smaller size. Remember when folks are looking for your show, you’ll want it to pop out at them amongst all the others that are on that page. Social Media: 1200×627 pixels – This is the canvas size for Facebook posts. Since Facebook no longer allows you to change this image manually, you’ll need to add it to the meta information you’re linking Facebook to. In WordPress, you can do this by changing the image used in Yoast SEO Premium. (This is a plugin that just about every WordPress user should have if they want to have good SEO.) If you don’t have this plugin, Facebook will more than likely use the Featured Image you have set for the post or page. Pixels (Dots) Per Inch: 72 is the minimum. Personally, I use 300 dpi. Ok, so you have everything ready to go and you’re looking at a blank canvas. Now is the time to ask yourself, what is this thing going to look like? Crafting a design for the cover art is really no different than designing a logo. You see what you like out there, and then mimic it. In this case, you can use the popular list on iTunes and see the covers of popular podcasts there. Once you get there, you might notice that there’s a ton of shows that have the host on the front. If your brand is about you, or you’re tightly involved with the brand, you’ll probably want to put yourself on the cover. If that’s not that big of a deal to you, then you can get a bit more creative and use more symbols in your artwork. Since AoL is all about discovering other’s takes on personal freedom, I opted to stay with the original compass idea. However, I dressed it up a bit by surrounding that compass with the sentence “Not all who wander are lost”. This is one of the trending thoughts that i’ve learned through the first 100 sessions. From there, I retouched the main title a bit and moved that up to the middle. I realized I had a ton of empty space in the last version and hopefully the title (now with a subtitle) will grab potential listeners’ attention a bit more! If you’re wanting to change the social media image a bit per platform, there’s one thing I want to mention. Make sure that the theme stays the same from platform to platform. Use the same colors, same fonts, and just about anything else you can from one to the other. You want to make them look like they’re connected. In the AoL Podcast social images, I even go as far as to use the same image of the guest of that session. The only platform that I drift away from this approach is Instagram. From what I can tell, you get a bit more attention if your posts are visually engaging. So I try to change things around a bit and make the layout of the image reflect the long-form quote and the image that I have of the guest (which goes along with that quote). So now that you’ve seen my new cover art, what do you think? Hopefully it inspires you to change your old one up a bit if it’s been awhile since you’ve modified it. I know several folks who make it a year to modify their artwork yearly. If you have a show, I’d love to hear why you designed your cover the way you did.